You lock your bike up and head inside the store to grab something. Maybe you’re meeting a friend for coffee or just browsing a shop. You head back outside to find your bike lock cut in half and your bike gone. Your heart sinks. You rely on your bike, and now it’s been stolen. Whether you depend on your bike to commute to and from work or you use it for exercise, having your bike stolen is no picnic. Prevent bike theft by purchasing a heavy-duty lock, so you can count on your bike always being where you left it. The table below is meant to help you see at a quick glance the similarities and differences between our top five bike locks. Be sure to read each individual review since we point out features of each bike lock that make it stand apart from the rest. Weight 4.55 lbs. 15.95 lbs. 0.7 lbs. 3.5 lbs. 4.55 lbs. 15.95 lbs. 0.7 lbs. 3.5 lbs. The table below shows where different bike locks can be used and for what purpose. U-locks are typically made of steel and covered in vinyl to protect your bike’s paint from chipping. To best use a U-lock, unlock the crossbar and fit the U around a fixed point (like a bike rack), bike frame, front wheel, and rear wheel. You’ll need to remove your bike’s front wheel and place it next to the rear wheel. Then lock the crossbar to lock your bike. Look for a U-lock that is made out of hardened steel and can withstand ripping. Fill the space inside the U as much as possible to make it difficult to use levers and jacks. Do not let the U-lock touch the ground because it is then susceptible to shears. 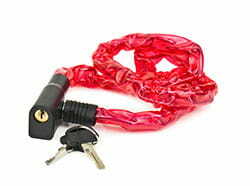 Use the U-lock in combination with a large-diameter twisted cable to provide further protection. Chain bike locks are typically made of steel links and covered in nylon or vinyl to protect your bike’s paint. Some include a built-in padlock, mini U-lock, or combination lock, while others are separate. These locks can be up to six feet long, so they can often reach around from the front to rear wheel without removal. Some chain bike lock models have special shaped links that make them difficult to break. These are typically carried in a pack, worn over the shoulder and across the chest, or around the waist as a belt. Cable bike locks are available in various lengths and thicknesses. They are made out of coiled wire and have a built-in or separate padlock or combination lock. They are typically covered in vinyl to protect your bike’s paint. If you purchase one long enough, you don’t need to remove your front wheel. Folding locks are made of metal plates linked together by rivets. The rivets let the plates rotate so they can fold and unfold. They are quick to fold up and travel with and can be mounted to a bike easily. The Kryptonite New York Fahgettaboudit U-Lock will not only keep your bike safe in high-crime areas, but it also has a name that’s fun to say. The lock offers $5,000 in anti-theft protection for a bicycle, which has us asking why not get this lock? Made of 18 mm hardened MAX-Performance steel, this shackle is resistant to bolt cutters and leverage attacks. It has a protective vinyl coating to protect your bike from getting dinged up. The lock comes with three stainless steel keys—one of which is lighted with a high-intensity LED bulb. It also scores a 10/10 on Kryptonite’s security ranking system. Purchase the Two Fish Lockblocks U-Lock Mount for around $12 on Amazon. Customers have left photos of how they mounted the lock to the handlebars, so you can see how it works. The Kryptonite New York Legend Chain & Padlock is an exceptional bike lock—where do we even begin? First, the padlock is shrouded and made of 16 mm hardened MAX-Performance steel, so it is too thick to be cut by bolt cutters. The disc cylinder in the padlock is extremely difficult to pick through. The chain is 15 mm thick and made of hardened steel, so it is resistant to bolt cutters. Although it could be cut by 42” bolt cutters, this would take an extremely skilled thief. This chain is very heavy, so it is not one you want to carry around with you daily, and you’d most likely want to keep it in one place. Unfortunately, this lock is not rated by Sold Secure, but that does not mean it’s a bad lock—it just means it hasn’t been submitted for testing. It scores a 10/10 on Kryptonite’s internal rating system. It includes three stainless steel keys and can be a challenge to thread through wheels and frame at first, but once you’ve used it a couple of times it is simple to use. 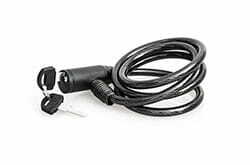 We chose this Ushake bike cable as our pick for best bike locks because it’s inexpensive and it will deter a thief in a rural community for a minute or two while you run inside a store. Cable locks aren’t our top choice when buying a bike lock, but if you’re in a low risk area, they’re a cheap alternative. There are 10,000 combination possibilities with this four-digit combination lock, and it’s easy to reset the combination whenever you want. It’s keyless, so you don’t have to worry about losing the key or finding a place to carry it while you’re on your ride. It also comes with a mounting bracket for easy transportation. ABUS was the original creator of the folding bike lock, and they have continued to be the best. The ABUS Bordo GRANIT 6500 is the best folding lock because it is made of hardened steel, has high protection against picking, and is rated high amongst competitors from Sold Secure. It is lightweight and compact, which makes it easy to travel with. Included are two keys, one of which is LED lighted. 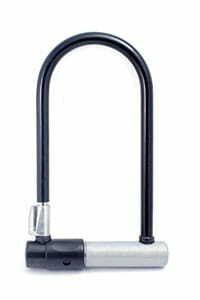 ABUS has it ranked at a “Maximum Level 15.” This is a great alternative if you’re in a high-risk area but don’t want to lug around a heavy chain or bulky U-lock. There are four main styles of bike locks: U, chain, cable, and folding locks. Thieves use bolt cutters and drills to break locks and steal your bike, so depending on how and where you use your bike, you may need heavier security to withstand these types of attacks. Consider your location and how long you need to secure your bike so that you can choose a lock sturdy enough for your circumstances. Kryptonite has a handy chart that defines the level of security you need for your bike lock. Consider your crime area by defining where you live: major metropolitan area, metropolitan area, college campus, suburbs, or rural area. Next, decide the length of time you’re most likely to secure your bike: overnight lock-up, all day lock-up, couple of hour lock-up, or quick stop lock-up. The riskiest scenario is if you live in a major metropolitan area and plan on locking your bike up overnight. The least risky scenario is if you live in a rural area and need to lock it up for a couple of minutes. What does all of this mean? If you live in a heavily populated area and plan on locking your bike up for longer, it’s important to find a really secure lock. Consider getting two different bike locks if you’re in the city. These locks will need to be heavier duty, so they are not easily susceptible to thieves. Sold Secure and ART are the two bike lock standard rating organizations. Sold Secure is based in the UK, and ART is from Holland. We recommend looking at their ratings over other companies because they are consistent. Companies like ABUS, Kryptonite, and OnGuard have their own rating systems, which aren’t as consistent as Sold Secure and ART across all bike locks. Sold Secure assigns gold, silver, and bronze ratings. It bases these ratings on how long the lock can withstand an attack. Sold Secure uses numerous attack methods including hacksaws, pliers, hammers, lock picking tools, and more. ART rates bike locks on a scale of 1–5, 5 being the best and 1 being the worst. They base this rating on how the lock performs in tests conducted by machines and engineers. These tests include cutting, freeze tests, attacks with objects, etc. The level of security you need will determine how high up the scale you need to go. Using the Kryptonite chart (linked above), if you are most often in the least risky scenario, you don’t need a gold rating from Sold Secure or a 5 from ART. Where do you want to carry your lock? This is one of the most important questions, so choose wisely. If you choose a bike lock that you have to carry separately instead of mounting it on your bike frame, but you never ride with anything to carry that lock, you’ll never use it. You want to pick a lock you see yourself using. It’s like shopping for new clothes—if you don’t like the pants when you try them on at the store, you won’t like them when you get home either. Similarly, if you like your lock and it matches your biking habits, you’ll use the lock. Carry your bike lock on your frame if you’re new to biking or using your bike primarily for commuting and running errands. Many bike locks allow you to place mounts on the frame to make it easy to store and go. This means you’ll be looking at cable locks or U-locks since they most commonly can be mounted on the frame. Want to carry your lock in a bag? Your possibilities are endless here, and you can really do any type of lock you want. Weight is something you’ll want to take into consideration. Four pounds can feel different on your bike frame compared to on your back, so you’ll want something lightweight. Is your bike for exercise? If you’re training for a race, you want to look for a lightweight bike cable lock since a lightweight bike was probably important to you during your purchase process. You also want your lock to fit onto your bike easily while you’re riding it. Because cable locks aren’t the sturdiest locks, however, you shouldn’t leave your bike for too long. When you’re exercising on your bike, you’re most likely running inside to use the restroom or grab a bottle of water, so you shouldn’t run into problems leaving your bike for extended periods of time. If you’re commuting or running errands on your bike, you can probably handle the bulkiness or weight of a sturdier lock. You may be riding around with a backpack, so you can always stick the lock in there for safekeeping. You’ll be locking your bike up for longer periods of time, so for this scenario you’ll want to make sure you’re purchasing a heavy-duty bike lock and consider buying two different kinds for extra security. Cable locks are not recommended for long periods of time. Always use a bike lock. Don’t use a cheap bike lock. Take your bike inside when possible. Lock your bike to something solid and immovable. Use two different bike locks, one on the front and one on the back. Don’t leave your bike in the same place every day. Take removable accessories with you (lights, pumps, quick-release wheels, seats, and cycle computers). An additional tip: if you see your tire is punctured, do not leave it and come back for it. This is a good sign that someone is planning on coming back later to steal your bike once there are fewer people around and there’s a longer window for breaking the lock. Overall, it’s important to get a heavy-duty bike lock with solid reviews. Make sure your bike lock is durable, sturdy, and extremely difficult (better yet, impossible) to cut. Consider purchasing two different styles of bike locks. This way, the bike thief needs multiple tools to steal your bike. 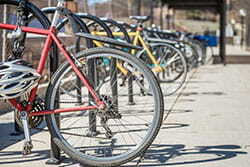 If thieves deem your bike too difficult to steal or think it will take too much time, they will move onto the next bike. What do you do to your bike to keep thieves away?